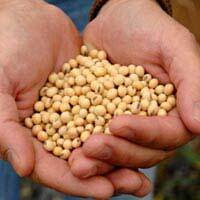 Home > Supplements Overview > Can Soy Protein Reduce Cholesterol? One reason people in countries such as Japan enjoy a relatively low incidence of heart disease could be because their diet is rich in soy, according to many dieticians and scientists who have studied the effects of foods high in saturated fats on cardiovascular health. Soy protein, found in foods such as tofu and soy milk, has been found in some studies to help lower the level of cholesterol in the blood overall, including low-density lipid cholesterol, or “bad” cholesterol, as well as triglycerides. It also, according to some studies, raises high-density lipid cholesterol, or the “good” cholesterol you body needs. When that happens, the cholesterol no longer clogs your arteries, and your heart health is better. A 2008 Australian study found that eating foods containing soy protein had no significant effect on lowering cholesterol levels at all. The study involved 83 men and women with an average age of 52 years who had “mild” cholesterol levels. They followed three specific diets for six weeks each to see if the soy protein had an effect or not. Soy contains isoflavones, which are oestrogen-like substances. Because of this, soy has been touted as being healthy for women after menopause, when their oestrogen levels decrease. But a U.S. study involving post-menopausal women found that soy protein had no effect on the levels of bad cholesterol, while the good levels showed only a small increase. There is no doubt that replacing foods in your regular diet that are high in cholesterol as well as saturated and trans-saturated fats with low-cholesterol soy foods such as tofu or soy milk can help your heart health. Any switch from a fatty diet to a healthier one can only do your health good. But whether it’s because you are regularly ingesting soy protein on the new diet, or because you are no longer eating a double-cheeseburger and fries for lunch every day, still remains to be seen! Tofu. Made from soybeans, tofu can be used as a meat substitute in stir-frys, in particular. It soaks up the flavour of the sauce in which it is cooked. Soy nuts. Roasted, they are tasty and nutritious. Soy milk. Can be used as a substitute in cereals and on its own, although is not great in cooking. Many people like sweetened soy milk in particular in coffee and other hot drinks, but it tends to curdle slightly. Soy smoothies are all the rage! Edamame. Many people recognise this exotic bean from Japanese restaurants, where it is served lightly fried with salt. All they really are is soybeans that are still in the pod. You can even buy edamame frozen at your local supermarket, and use them instead of frozen peas. It’s unclear how soy protein can be of help when it comes to lowering cholesterol and heart health, but as a replacement for high-fat foods, it’s definitely worth eating. Why wait until studies on soy protein are conclusive – start adding soy to your diet today for better health.